I blog about Cushing's because even some of the endocrinologists I've seen didn't know what the best tests were for Cushing's, and multiple, not one test, are required before you rule it out. 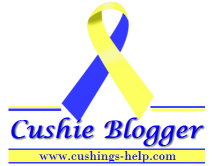 I blog about Cushing's because it's such a life altering thing to go through, you can't possibly make it through without support. I am glad you and others like you blog about Cushings and other disorders. It helps people find out about these things where before they'd never know.